Just like us, our pets can’t wait to get outside to enjoy the warm spring temperatures after a long winter cooped up inside the house. One of the most common things we think about when it comes to letting our pets outside in the spring is pesky fleas and ticks. We too often overlook the dangers and discomfort caused by wasps and bees. Unfortunately, so do our pets, in fact they often try to catch them while getting stung in the process, usually on their most sensitive spots such as their noses and tongues. There are a few small differences between bee and wasp stings. A bee’s sting is barbed and cannot be extracted by the bee after it has stung leaving the sting and part of the insides in the victim whilst continuing to inject venom. Wasp stings on the other hand are not barbed and are easily extracted by the wasp, which enables it to sting its victim multiple times; wasp stings also inject a complex protein venom. We aren’t always present when our dog or cat gets stung by a bee or wasp, and unfortunately our pets are not able to verbally articulate if and where they have been stung, fortunately there are several signs that will let you know if your pet has managed to get himself stung. One of the most common signs that your pet may have got stung is redness, swelling or visible irritation on or around the spot that the sting has occurred. If the sting is somewhere that is not easily visible such as under the fur on the tongue or in the nostril you can watch to see if your pet is licking, biting or rubbing an area, this will usually indicate a sting. Be careful to watch for swelling around the face and neck, if this happens or if you pet is showing signs that he/she is having difficulty breathing then you should seek veterinary attention for your pet right away as this may indicate a serious allergic reaction. Bee stings should be removed as soon as they are spotted, this can be done with tweezers or even your fingers, some people rub mud on the sting to help to draw the sting out. Bee stings are acidic so applying some bicarbonate soda to the area will neutralise the pain and give your pet some relief. Wasp stings are not left over after the sting; however the area will be red or swollen. 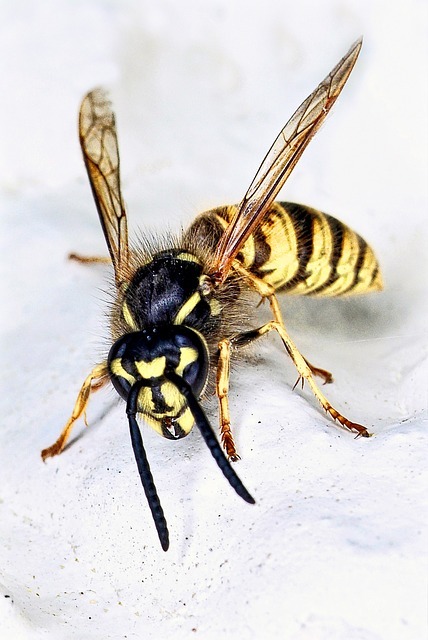 Wasp bites are alkaline; applying some vinegar to the area will reduce the pain to a manageable degree. Finally please seek advice from vets if there is large amount of swelling or itching anywhere as it can become very uncomfortable and require treatment. The sooner treatment is given, the less bad the reaction will tend to get.